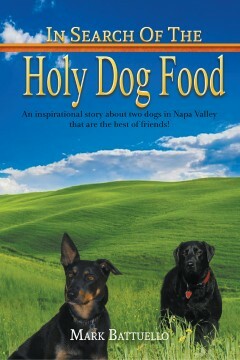 In Search Of The Holy Dog Food: An inspirational story about two dogs in Napa Valley that are the best of friends! Thank you for your purchase of The Holy Dog Food! My name is Mark Battuello. I have been following these two dogs for over a year. Cabby is our family’s farm dog who loves to run free in the vineyards on our farm. He met our neighbor’s dog Cooper and the two became great friends. Our neighbors have become great friends with us as well. I enjoyed writing the story and building the character of the dogs. I studied photography under professional photographers while also studying it during my college years. My hope is that this story has been inspirational for you which encourages the value of a great family pet. Part of the purpose of my photos for this story is to get you to really see the relationship we can have with these animals and what we may learn from them to greatly enhance our daily lives and theirs.